The 2017 Cheltenham Festival is finally here and William Hill have launched some incredible offers on top of their amazing £30 Free Bet for all NEW customers. Find here all William Hill's betting offers, exclusive promotions and bonuses on this year's Cheltenham Festival! The qualifying bet must be placed at min odds of 1/2. Get a 25% bonus on winnings if a horse wins by 5 or more lengths: get a 25% bonus on your returns if you back the winner, or get your money back as a free bet if your horse finishes second. Bet on any Cheltenham Festival race and if your horse finishes second, get your stake back as a Free Bet*. - 5 or more runners must race for the offer to qualify. - £25/€25 Maximum Free Bet. - First selection per race only. * Free bet amount will be bet stake minus total winnings. If winnings exceed total stake, no free bet will be granted. 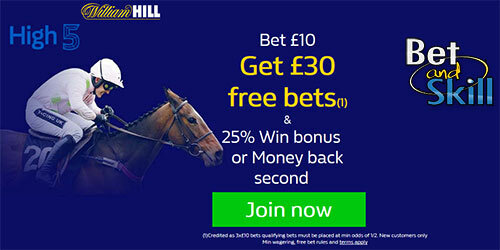 "WIlliam Hill Cheltenham £30 free bet, best odds and betting offers"